Romeo and Juliet - How does Shakespeare make you feel increasingly sympathetic towards Juliet? 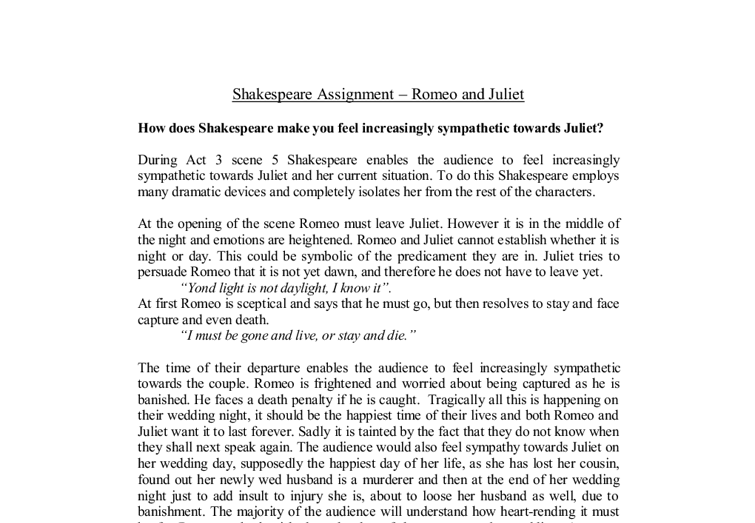 Shakespeare Assignment - Romeo and Juliet How does Shakespeare make you feel increasingly sympathetic towards Juliet? During Act 3 scene 5 Shakespeare enables the audience to feel increasingly sympathetic towards Juliet and her current situation. To do this Shakespeare employs many dramatic devices and completely isolates her from the rest of the characters. At the opening of the scene Romeo must leave Juliet. However it is in the middle of the night and emotions are heightened. Romeo and Juliet cannot establish whether it is night or day. This could be symbolic of the predicament they are in. Juliet tries to persuade Romeo that it is not yet dawn, and therefore he does not have to leave yet. "Yond light is not daylight, I know it". At first Romeo is sceptical and says that he must go, but then resolves to stay and face capture and even death. "I must be gone and live, or stay and die." The time of their departure enables the audience to feel increasingly sympathetic towards the couple. Romeo is frightened and worried about being captured as he is banished. He faces a death penalty if he is caught. Tragically all this is happening on their wedding night, it should be the happiest time of their lives and both Romeo and Juliet want it to last forever. Sadly it is tainted by the fact that they do not know when they shall next speak again. The audience would also feel sympathy towards Juliet on her wedding day, supposedly the happiest day of her life, as she ...read more. When Lady Capulet enters, she is not at all sympathetic towards Juliet. Lady Capulet mistakes Juliet's tears for Romeo's departure, as grief for Tybalt. She begins insulting Romeo believing that getting vengeance will resolve the situation. "We will have vengeance for it, fear thou not". Lady Capulet is promising revenge on Juliet's husband, the only person who stands by her and the one person she claims she loves. Shakespeare is building up sympathy for Juliet, as she can't even tell her own mother about her marriage. We watch her distress and share her feelings of hopelessness, as each person turns away from her until she is totally isolated. Juliet does reply to her mother but her words are filled with double meanings. "To bear a poison I would temper it." Lady Capulet believes Juliet is going to make it deadly, however Juliet means to weaken the poison to give Romeo peaceful sleep. The double meanings create sympathy for Juliet, as the audience are aware of what Juliet is really thinking and feeling. They know how alone she is and how she is forced to hide her true feelings behind double meanings. Then once Juliet's mother they has finished vowing to kill Juliet's husband, Lady Capulet informs Juliet that Capulet has arranged for her to get married. Juliet is obviously furious and completely opposed to this. She has just lost her husband and her cousin and is now being forced into a second marriage to a man she is hardly well acquainted with. ...read more. 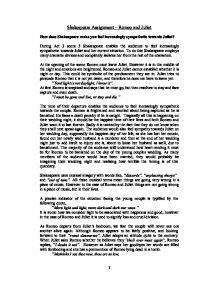 All these circumstances are compounded by the fact that she cannot marry, as she is already wed. She has lost her cousin, who she was very close to and her husband has been banished. She is also unsure of her feelings towards Romeo, as to whether he is a murderer or her lover. Her life has been turned upside down in a matter of days and she is now completely alone. The scene finishes with a soliloquy from Juliet. From this we can see how furious she is with the nurse and how hopeless she believes the situation to be. At the very end of this short soliloquy she puts forward the only two ideas she can come up with. The first idea, her plan A so to speak, is to seek help from the Friar. However her plan B is to take her life if all else fails. "If all else fail, myself have power to die." This last line is when tension is at its utmost and so is our sympathy for Juliet. The extent of despair that she is feeling is explicitly exposed, when she begins to contemplate taking her own life. In conclusion, throughout this scene Shakespeare employs many dramatic devices as he builds up the audience's sympathy for Juliet. He does this through his choice of language and vocabulary, the way he isolates her from the rest of the characters and the terrible timing of each situation. Ruth Fitzpatrick 11S 1 ...read more. The Friar has a plan for Juliet to take a potion that will make it look like she is dead for 42 hours and then when she has been laid in the family tomb Romeo will come and pick her up and take her to Mantua with him. It takes us to the bedroom where Romeo and Juliet are asleep next to each other. They have just made love, and our now officially married. Romeo wakes up and must leave early morning as he is banished from Verona. This can be read two ways, the first means she won't be happy until Romeo is dead, the other is she won't be happy until she sees Romeo, dead is her heart. Why do you feel sympathetic towards Juliet ? Juliet doesn?t mind not being a Capulet as she would rather be with Romeo. She explains she will ?deny thy father? and ?refuse thy name?. I sympathise towards her as she cannot do what she wants and whatever affects her family has an affect on her.